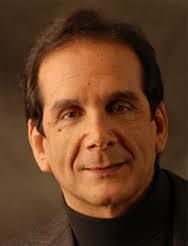 Charles Krauthammer – born March 13, 1950 – American Pulitzer Prize-winning syndicated columnist, political commentator, and physician. 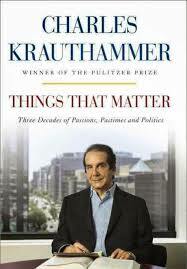 Don’t miss this book because you think Krauthammer’s politics are incompatible with yours. He says, “I’ve skipped over much of the partisan contention that characterizes the daily life of a democracy – the tentative, incremental, ever-improvised back-and-forth that occupies much of the attention of a political columnist. I’ve tried to give as little space as possible to campaigns and elections, to personalities and peccadilloes, to things that come and go.” What you will find between the covers of this book is the brilliant, hilarious, poetic writing of a man who matters! You will laugh until you cry reading In Defense of the F-Word, and just plain cry while reading Of Dogs and Men. These short pieces that can be picked up and put down all touch on what matters to Krauthammer, and in this world…..People like his brother Marcel, and Winston Churchill. Don’t Touch My Junk, about getting through airport security are a few of my favorites. The writing, the vocabulary lesson, the breadth of Krauthammer’s knowledge, all contribute a wisdom and articultness that will be a lasting contribution to what matters. This entry was posted in A Writer's Writer and tagged Book Reviews, Charles Krauthammer, Things That Matter. Bookmark the permalink. Ah Stepheny – but what about the innocence of cats when they are at their most cunning?! Its sad how sweet and round eyed they manage to look when depositing a severed mouse head where you are bound to step on it!